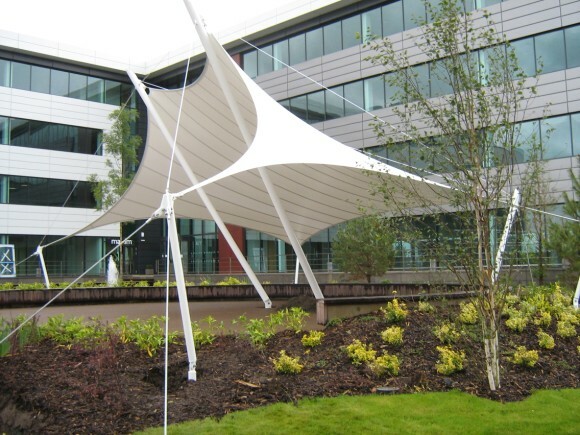 Tensile Fabric Architecture Static or deployable or with the ability to respond dynamically to the environment. Limited only be your imagination, decorative features or functional roof structures, designed for impact and practicality. For Internal applications fabric not only has an aesthetic appeal but also has very practical characteristics. It can enhance or hide fixtures, reduce noise, diffuse or screen out light, create a fire barrier, be used as a means of protection, or purely give space ambience. Every project is unique, so in depth consultation with the architects or interior designers is required to establish the exact specification. Particular attention is given to the desired effect or function of the structure as well as discussing the installation details. These discussions allow us then to source the most suitable fabric for the application and liase with metalwork fabricators, printers and joiners as required. Having now been involved in a wide range of projects, nationwide, we know we can offer a comprehensive service. Whether you are starting with a blank drawing board and require design advice or approaching us with detailed drawings, we can help you bring your ideas to life.